Mel B is back! The Spice Girls singer stepped out with a bandaged hand at a London hospital after undergoing emergency surgery earlier this month. The America’s Got Talent judge, 43, arrived in Los Angeles on Friday, December 21; she was spotted with her right hand wrapped in a white cast. As for her outfits, she was wearing red sneakers, a red, white and blue zip-up hoodie and matching pants. She looked in good spirits as she was chatting on her cell phone. As previously reported, Mel B's close friend Gary Madatyan revealed to media on December 10 that the songstress was injured in a fall at a friend’s home. 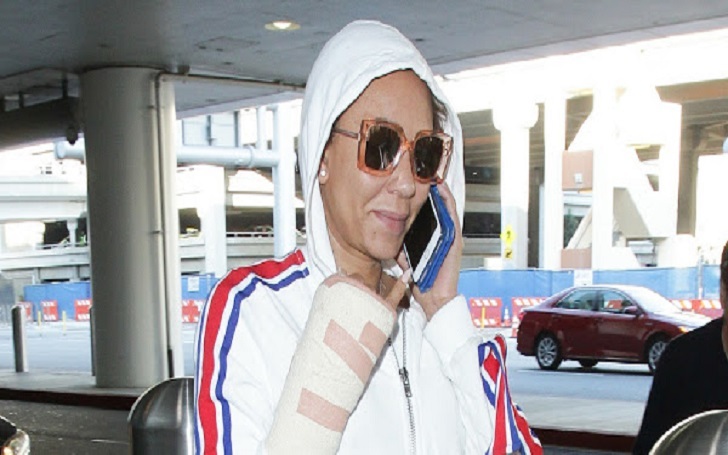 Earlier that same day, Mel B revealed that she had been to the hospital for operations after breaking 2 ribs and Severing her hands, with sharing a couple of Instagram posts. Mel B’s fellow Spice Girls members Emma Bunton, Geri Halliwell and Melanie C visited her at the hospital at the time. Nikki Bella and John Cena Spotted Together: Are They Dating Back Again?